Let's start with the second-most-recent report. 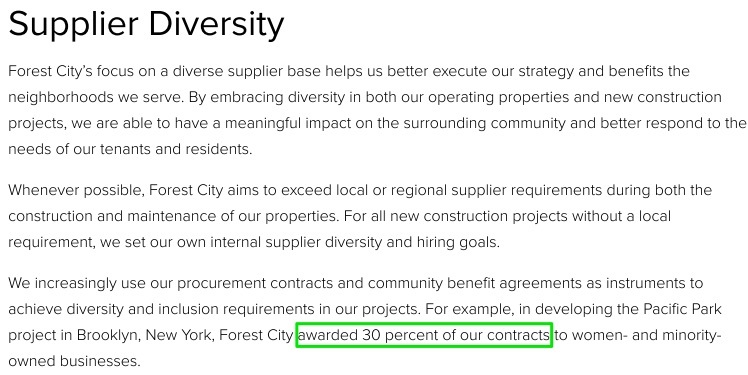 In its 2016 report, released last year, Forest City gave itself a giant pat on the back: "For example, in developing the Pacific Park project in Brooklyn, New York, Forest City awarded 30 percent of our contracts to women- and minority-owned businesses." Really? From what I know covering the project, it seemed unlikely that 30 percent of contracts went to MWBEs. So I asked for documentation. A spokesman responded: "Please note that the corporate responsibility report has been updated to correct an earlier error and now correctly states that the 30 percent is a goal we are working toward." Was it really an error or had they not expected anyone to check? The correction, actually, was incomplete. The update was made only on an online page (at this link, via the Wayback Machine) that excerpted the 2016 report, while the full document (also below) has still not been updated. The actual figures are unclear. True corporate responsibility would have meant that Forest City hired the Independent Compliance Monitor, purportedly required by the 2005 Community Benefits Agreement (CBA) that Forest City Ratner signed with eight community groups, a document that set those MWBE goals. That monitor could have reported on supplier diversity. But Forest City, whether wary of scrutiny or just frugal, never hired the monitor, and the CBA signatories--the only parties with legal standing to challenge the private contract--have never pushed, at least not publicly. Moreover, the claim that "Forest City awarded" was misleading syntax. The project is hardly finished and, of what's built, Forest City was responsible for only a fraction. Forest City, while the initial developer of Atlantic Yards, in 2014 sold 70% of the project going forward to Greenland USA, excluding one tower (of 15) and the Barclays Center operating company. The new joint venture, Greenland Forest City Partners, effected the name change to Pacific Park, and then built three towers together. This year, Greenland bought all but 5% of Forest City's remaining share going forward, and the Greenland-dominated joint venture just sold three parcels to two other developers. Forest City's 2017 report, released this June, offered a special sidebar, headlined 535 Carlton Opens as Pacific Park Brooklyn’s First All-Affordable Community and also reproduced below. "In June 2017, we opened the doors to 535 Carlton, a LEED-certified, all-affordable apartment community and the newest property in Forest City’s mixed-use Pacific Park Brooklyn neighborhood," the company said. That combines seemingly praiseworthy progress with some significant spin. While it's true that the "298 homes are reserved for low, moderate and middle-income New Yorkers" and residents can "enjoy a first-rate amenity package," not only must residents pay to enjoy the gym, lounge, and children’s playroom, the general description of affordability obscures a significant switch. Moreover, this affordable housing hardly matches what Forest City long promised--in that Community Benefits Agreement and also the Housing Memorandum of Understanding the developer signed with the advocacy group ACORN. Notably, of the 2,250 below-market units promised in the full project, only 20%, or 450, were designated for upper middle-income households whose earnings now average over six figures. Rather, in this building, half the apartments are designated for that cohort. That's hardly where the need is greatest. In fact, relatively few households bothered to apply for those units in the city's housing lottery, and there were so few takers that some 95 middle-income units (of 148) were marketed outside the lottery, some with an additional two months free on a one-year lease, the kind of sweetener more common with market-rate units. Beyond that, the language is curiously misleading. Again, it's not "Forest City's" project, but rather a joint venture with Greenland. Also, unless every apartment building containing nearly 300 units can be described as a "community," that term seems like overkill. Nor does "Pacific Park Brooklyn," an irregular 22-acre site that remains very much unfinished and which is bisected by broad Flatbush Avenue, constitute a "neighborhood." Most people, even those affiliated with the project like architects or real estate agents, call it Prospect Heights. Both the 2017 and 2016 reports can sound odd to those knowledgeable about the project. The reports state "Forest City helps foster community ties," offering: "For example, associates in New York City focused on enhancing transportation networks, including walking and biking paths and ferry access, between the surrounding boroughs and our new Pacific Park property." Really? The Pacific Park site is nowhere near the waterfront. There are no walking paths yet, given that most of the promised open space remains unbuilt, though two buildings have patches of green in their backyards. And though bike lanes near the project have been restored, that's only after they were taken away or shifted to accommodate construction. A final oddity regards the company's proud recitation of its strategy: "Forest City builds with the intent to own and operate our properties for the long term. This strategy allows us to expand our focus beyond short-term development budgets and instead work on optimizing the total lifetime cost of our properties." That may be an accurate generalization, but Atlantic Yards/Pacific Park represents the exact opposite tactic. "We don't build to flip," Forest City executive MaryAnne Gilmartin said in 2010. And while Forest City didn't flip Atlantic Yards/Pacific Park for a profit, it exited to protect itself from the project's financial troubles.